Park Shore Resort, 1st Flr., End Unit- EXTENSIVE HIGH END LUXURIOUS RENOVATION! Need more information about booking Property 6873299 ? 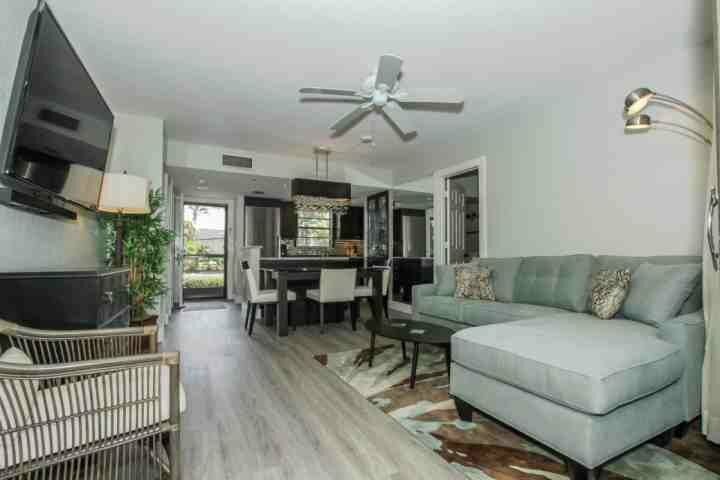 ***IN 2016 THIS UNIT HAD UNDERGONE AN ENTIRE RENOVATION INCLUDING NEW KITCHEN, NEW FLOORING, PAINT & LIGHT FIXTURES THROUGHOUT, & NEW FURNITURE! The resort offers free wifi inside and outside the units and wired access for your computer is also available. In the lobby, you'll find 2 computers and printer w/internet access. In addition, there's on site racquetball, pickleball, tennis, small fitness center, heated pool, hot tub, and 6 BBQ grills throughout the property. The picturesque grounds include walking bridges, ponds, & fountains that create a truly tropical oasis setting. This 2 BR(King w/TV, 2 Twins in Guest BR, and Queen sleeper sofa w/upgrade memory foam mattress in LR w/large Flat Screen TV and DVD), 2BA (Tub/Shower combo in Master, shower only in Guest), 1st Floor, West Facing, End Unit w/newly screened lanai in Bldg. F, has incredible views! It's also conveniently located (property map included in the pics) within close proximity to the Lobby, Pool, and Restaurant. No elevator needed for this newly renovated & luxuriously decorated first floor, end unit!! This unit is also equipped with stackable washer and dryer. Don't delay in making your reservation today!!!! !